“Who can take a sunrise, sprinkle it in dew. Cover it in chocolate and a miracle or two? The candyman, the candyman can.” Get your very own Willy Wonka experience in Oklahoma! 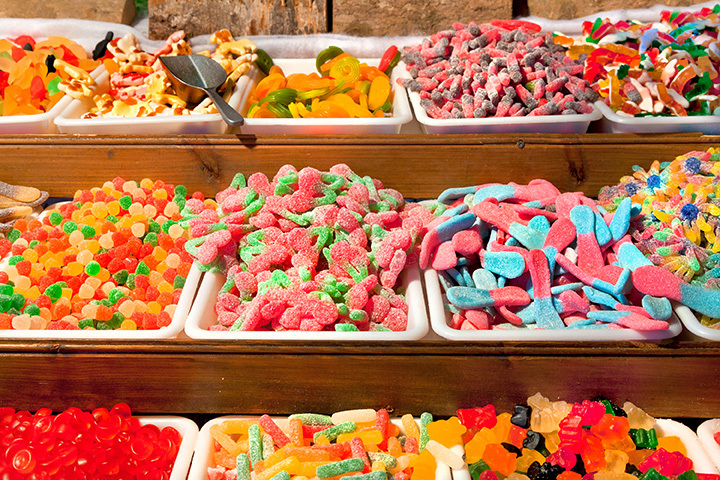 If you’ve got a sweet tooth, you’ll want to check out some of these fantastic candy stores in Oklahoma. Bedre Chocolates can be found in many stores across the state, but they’re made in Davis. You can shop at the main store and watch the chocolates being made. Sweet Tooth Candy has a full candy buffet featuring “Made in Oklahoma” chocolates. Next time you’re planning a wedding, party, or any kind of corporate event, consider added a Sweet Tooth candy buffet to really liven things up. Woody Candy has been making fine candies and chocolates since 1927. You can only sample the orange-spiced pretzels in the store, and boy are they heavenly! Bricktown Candy Company has a fun selection of candy, chocolate and even gelato! This cute little spot is described as having a 1950s soda shop vibe to it. You can’t beat this classic. Decadent delicacies like hand-dipped chocolate strawberries, chocolate covered almonds and chocolate lady bugs, (chocolate dipped marshmallows) await when you visit this store. Gourmet chocolates and gelato can be found in this small store in downtown Bartlesville. It may be tiny, but the chocolates pack a huge punch. Double-dipped malt balls, fruit slices and specialty gummi bears can be found in this store, located near Western and NW 42nd St. Get your Easter chocolates here for a special touch to your holiday. You can smell the chocolate and coffees outside the store before you even open the door. Try a handcrafted truffle, which will practically melt in your mouth. The white chocolate cherry truffles are a personal favorite, but you’ll find a large selection of delicious hand-crafted truffles and chocolates to delight your mouth. If you like salt water taffy, you have to check out Sweetness Factory. They have 22 different flavors, along with a wide assortment of other candies, including retro and imported brands.